I recently got my hands on an automated chemical testing robot that was no longer in use. I plan on turning it into a CNC router, it will mostly be used for cutting wood and plastic but occasionally aluminium. The machine currently has adequately solid X and Y axis bearing setup however the Z axis has a basic rack and pinion design with only two rods and 4 bushings as the linear guide. 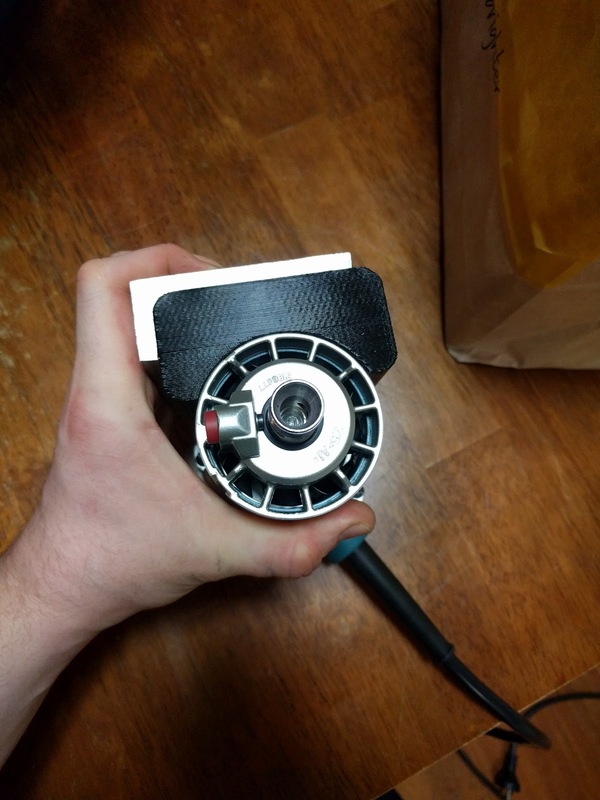 The Z axis will need to be upgraded to increase its rigidity and handle the weight of the spindle motor. 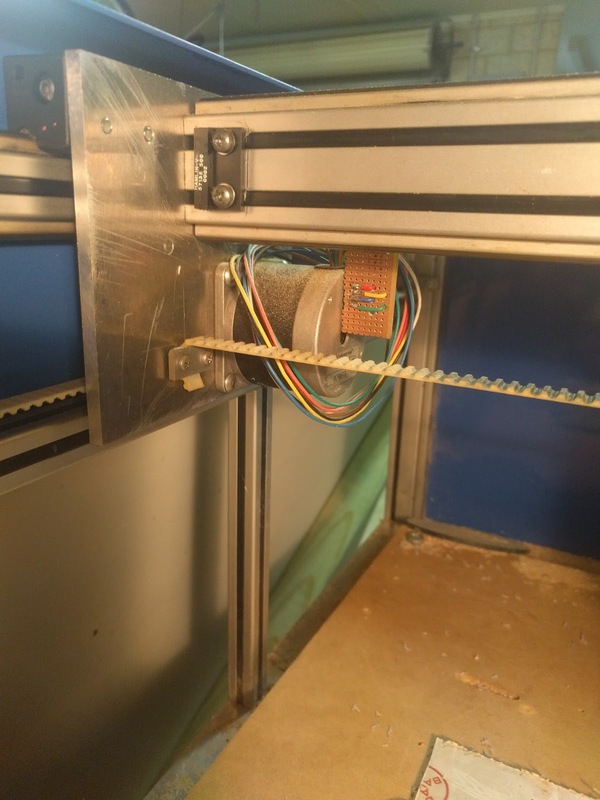 As seen in the photo below the existing Z axis is mounted together with the Y axis motor inside a small, thin walled, aluminium box. The box will be scraped and all the electronics and mounting hardware will be re-used. 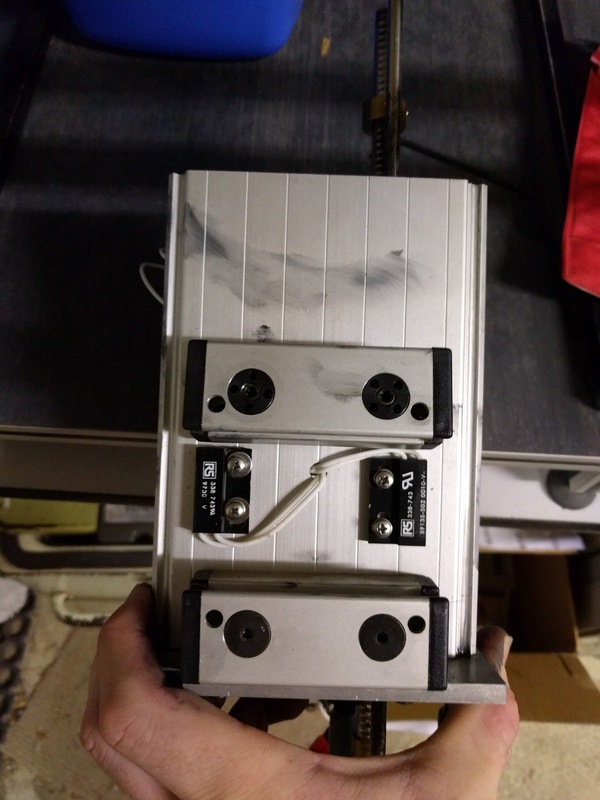 The left photo is looking up at the bottom of the box, the pulleys you see are the drive for the Y axis, I will be reusing these as well. 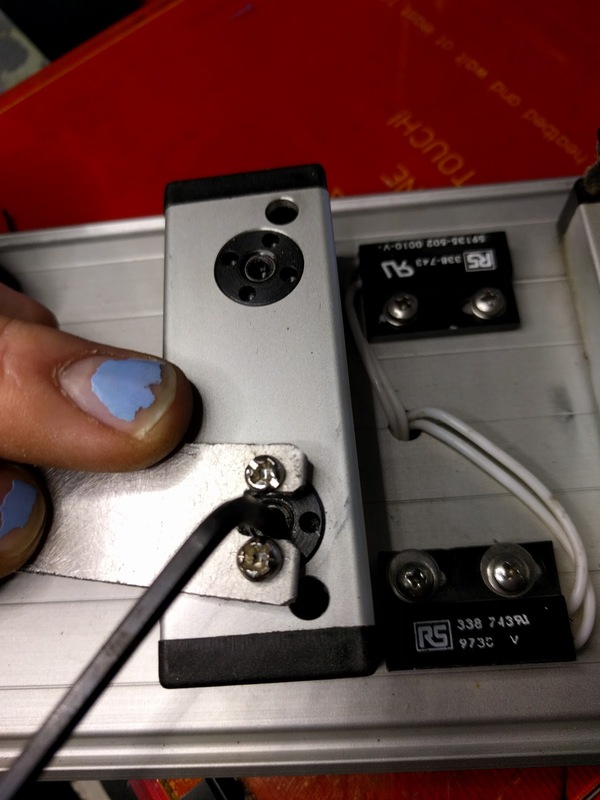 The right photo shows the bearings for the Y axis and the Y axis reed switch end stops. The bearings require a special tool (or perhaps just the right sort of pliers) which I did not have, so I came up with my own solution. It is a shaped piece of thin aluminium stock with a couple of 3mm bolts tapped into it. 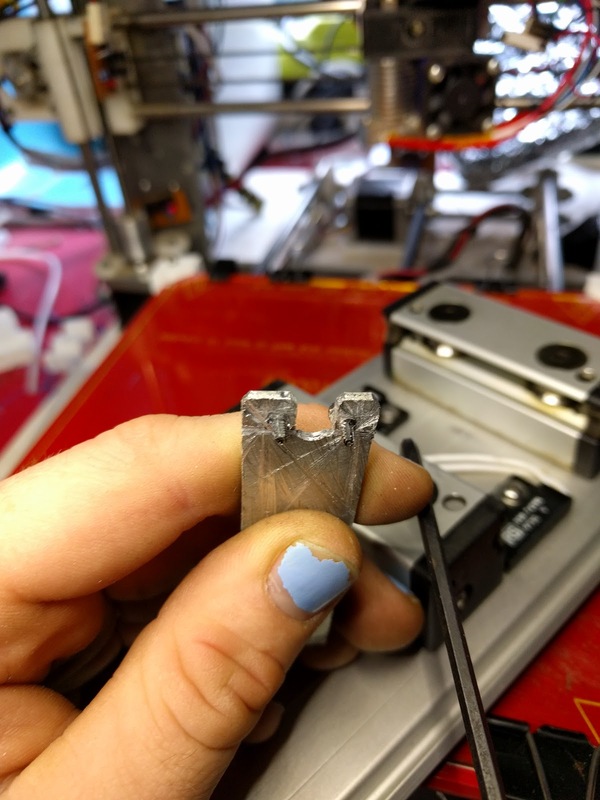 This allows access to the center where a bolt lays. 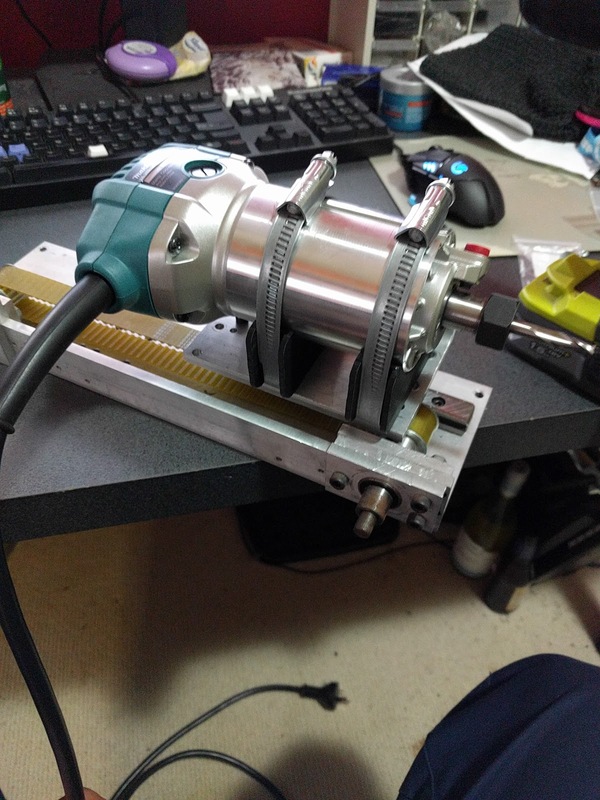 My tool worked great, the allen bolt is actually a cam shaft with the internal bearing riding on it and the outer ring is essentially a lock nut to keep the cam shaft in the right position. This allows you to adjust the vertical spacing between the two sets of bearings. 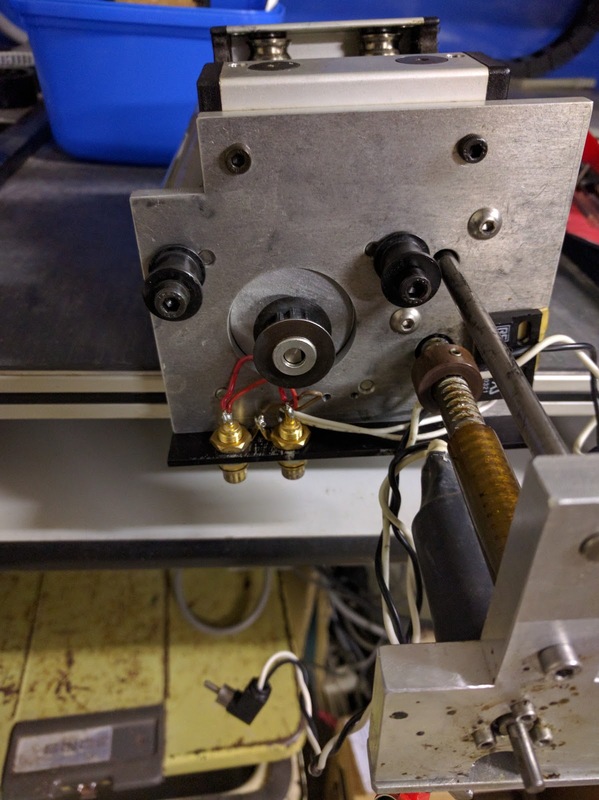 I was lucky enough that I had access to an old CNC gluing machine which has a small xy axis carriage. I set about to tearing it down to it's useful pieces. The photo to the right shows my spindle motor next to some of the parts from the gluing machine, I decided to use one of the gluing machines carriages to drive the z axis up and down. This meant I can reuse the belts and motor mount which saves on fabrication. These are the linear rails and bearing blocks I got out of the gluing machine. One set of these will be used for the Z axis. 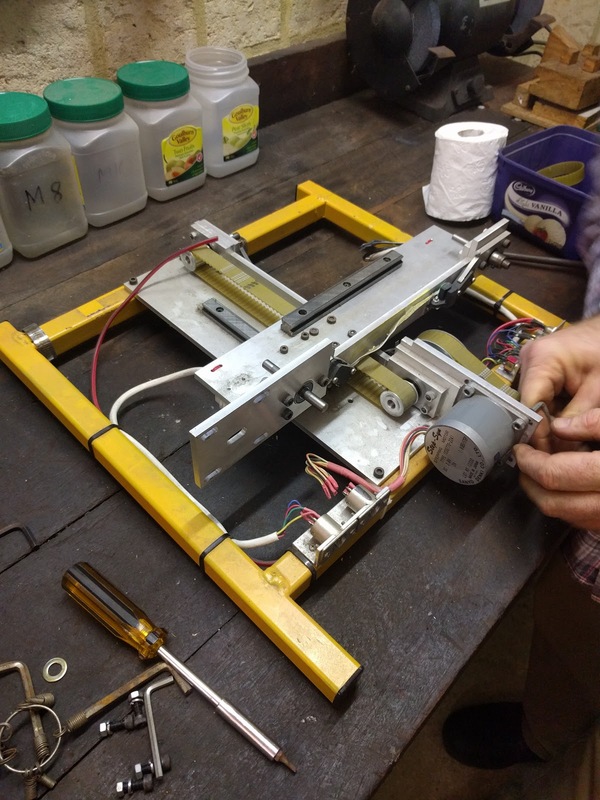 The Y axis on the chemical machine is supported by bearings both sides but only has a single side driven by a motor. That was fine when all it was doing was dropping a probe into some liquid but with a router the forces will be much higher. I will need to add a motor and belt to the non driven side. The plates that holds the Y axis rail to the X axis bearings is what the original X axis motor is mounted to so I will try and mirror this on the other side. I pulled the original non motor side plate off the machine and took all the dimensions for the bearings. I went to a shop called Di Candilo Steel City, they are a steel supplier and manufacturer so I went to their off cut section and bought a small section of aluminium plate that matched the thickness of the plate from my machine. 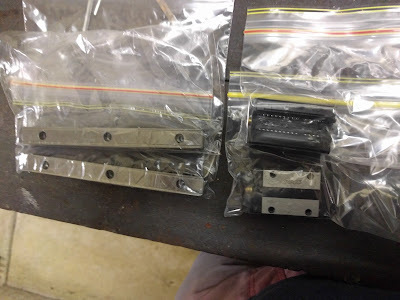 I had a couple of spare belts and pulleys from the same place I got the original machine from so I used these to put together the new X axis motor drive. The photo below shows the back side of this plate. 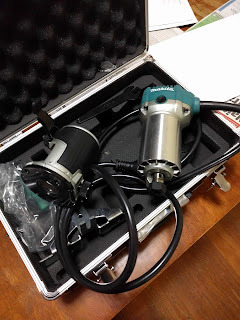 I ended up going with a Makita handheld router with 750W of power and it has a speed controller built in. This should be good enough for my purposes, I don't really have any idea how long it will last but I have found people making replacement collets for it so evidently someone has liked it enough to make aftermarket parts. 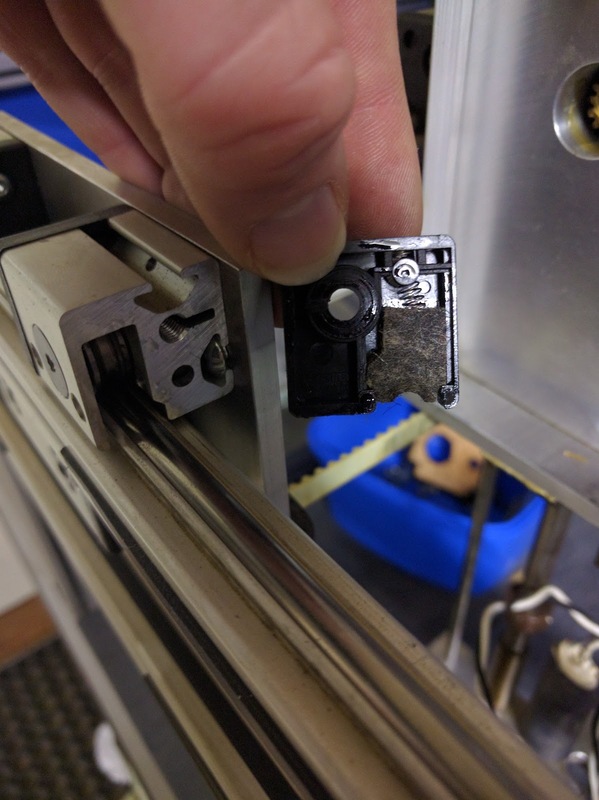 The photo on the right shows a large 3D printed block to cradle the spindle motor. These mounts are very wide and are in compression so should handle the loads. The aluminium angle is from the gluing machine I pulled apart. 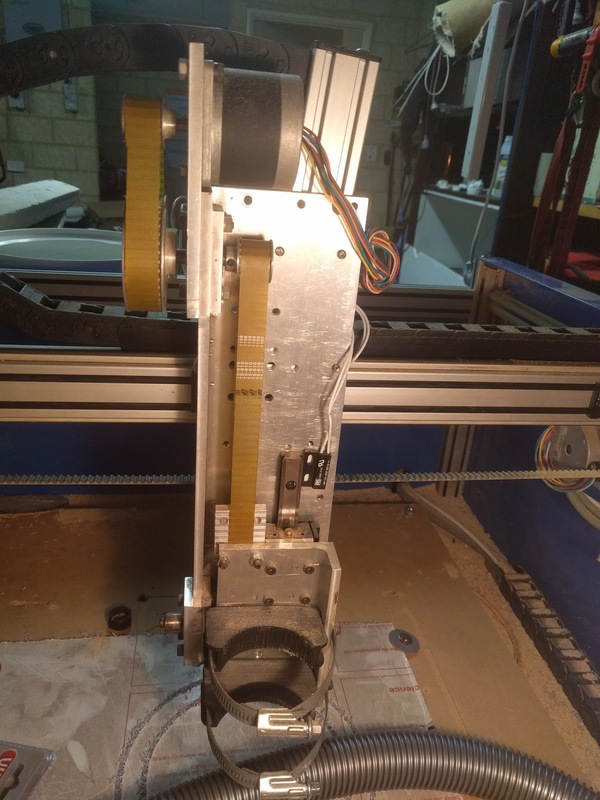 Constructing the Z axis was relatively simple. 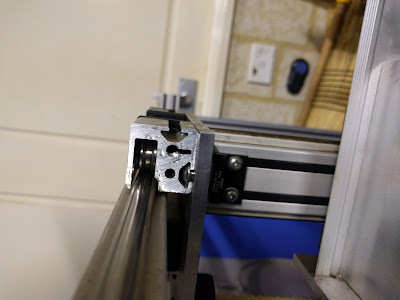 I used one of the glue machine axes but modified it a bit by moving the linear rail a bit and mounting the bearing block to the back of the spindle mount along with the belt latch. The motor assembly, belts and pulleys were already there so I didn't have to do any fabrication in regards to those. I tried very hard to ensure I had square holes for the Y axis bearings but my first try I was out. Luckily enough I had room to move things around and second time around it was much more true. In the photo below and left you can see the spindle motor is attached using large pipe clamps cut in half and bolted to the motor mount. The photo on the right shows the Z axis mounted to the machine without the spindle motor. For now I have the end stops attached with double sided tape, once I confirm all the motion I will drill and tap some permanent mounting holes for them. The photo below shows the back side of the Z axis, the motor shows drives the along the Y axis using a belt and pulleys. This photo shows most of the original control electronics pulled out of the control box. The original controller used a large industrial PLC and 3 external stepper driver boards. I have no interest in trying to re-use the PLC and from what I was told one of the stepper drivers was dead so all of that has gone to the junk pile (I'll keep the stepper drivers around for future projects). The only thing I kept from the original box is the power supply and wiring. Pictured sitting in the control box is a small Arduino based RAMPS board I was contemplating using. 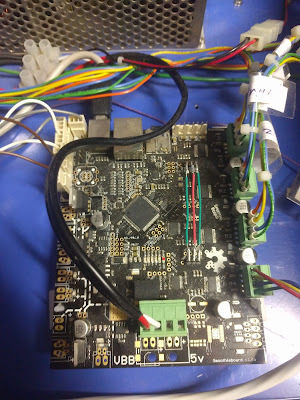 For the control electronics I settled on a product called the Smoothieboard, I won't go through all the details of it here but it is a 32-bit ARM board with up to 5 stepper drivers on board, plenty of generic I/O and ethernet connectivity. 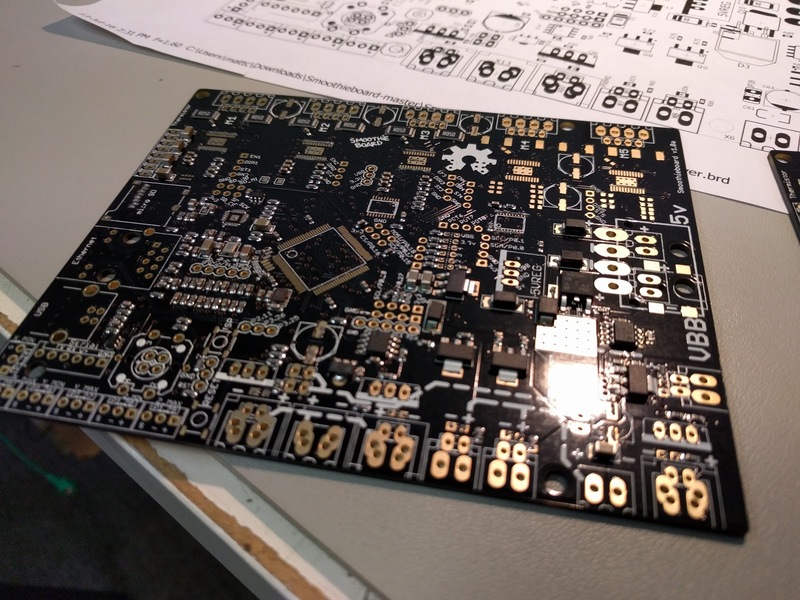 I could have purchased one of these boards fully assembled online but instead I decided to build one (I actually built two at the same time for about the same cost as buying one). 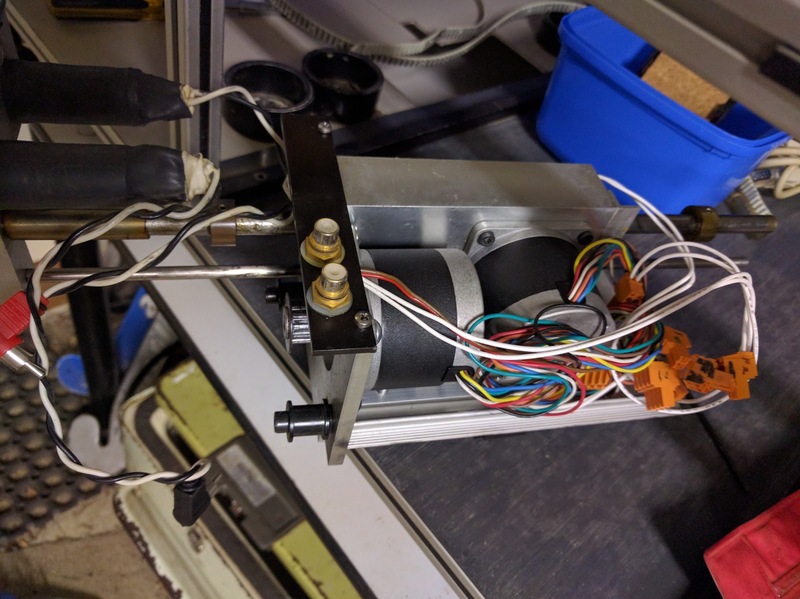 I used a pneumatically controlled dispenser to lay out my solder paste, hand placed all the components with tweezers then re-flowed them in a modified toaster oven. The photo below shows the Smoothieboard installed in the original control box. 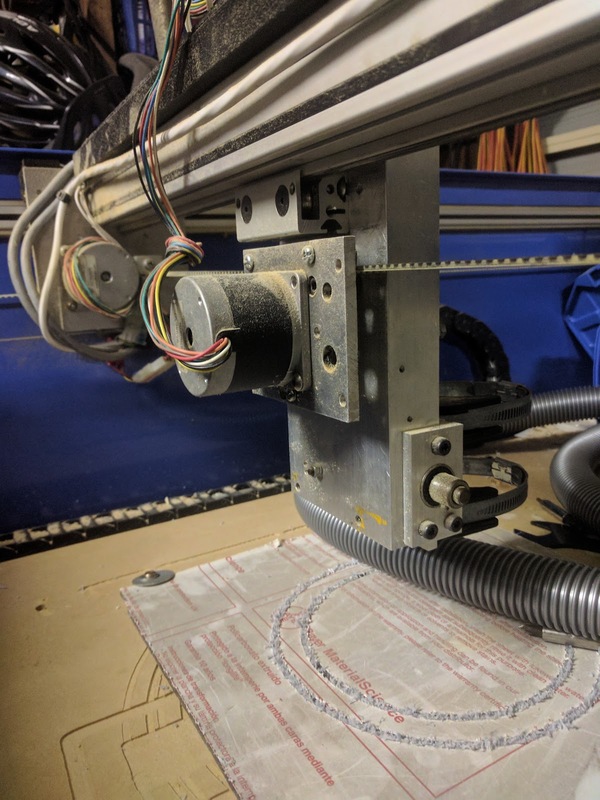 I used all of the existing wiring in the machine along with running an extra cable to drive the added X axis stepper motor. I spent a bit of time calibrating the software for the control electronics and making sure everything was reasonably square. 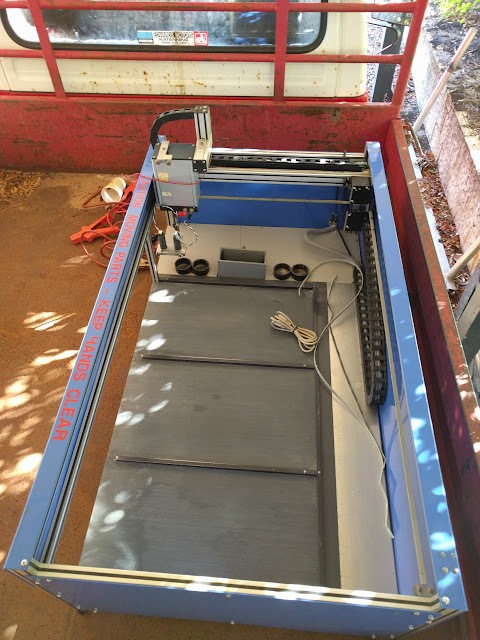 CNC milling machine is getting closer to being complete! 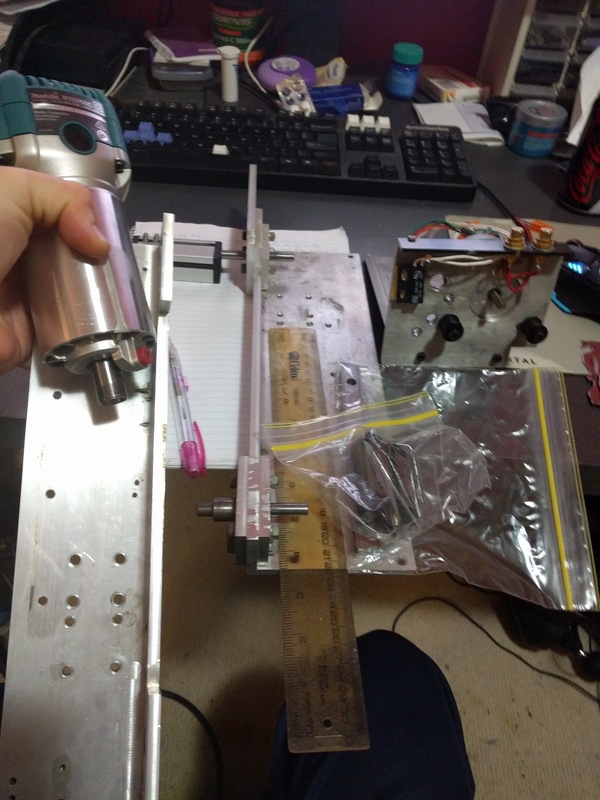 I have a few things to tidy up still like rewiring the spindle motor, get speed feedback from the spindle and add a dust extraction system to keep the mess down. 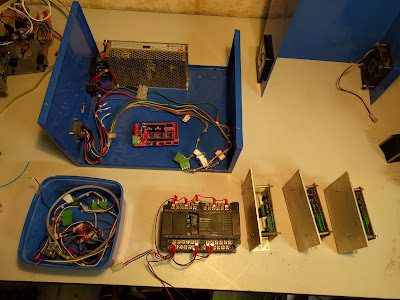 These are all future projects, for now I have a use for the machine which I will show in a future post. I also had the mill drill a bunch of holes in the spoilboard for mounting parts. Slowly but surely. 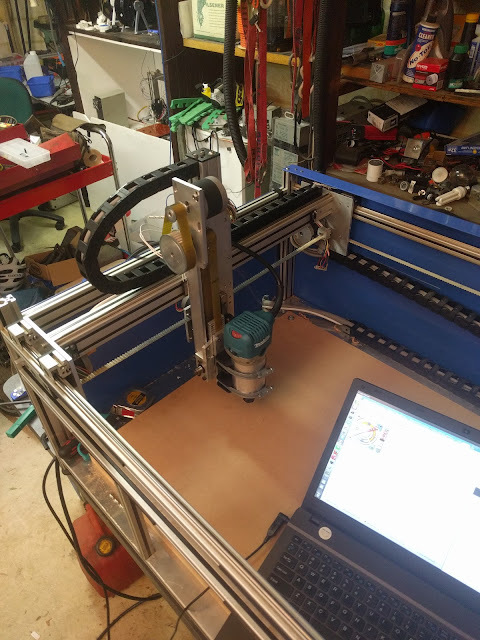 Getting my mill to drill itself.